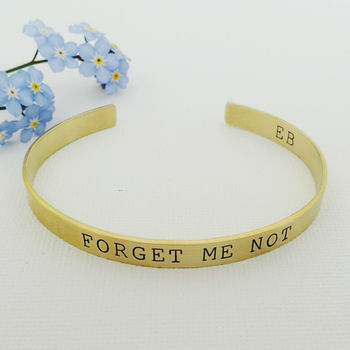 A beautiful brass sentiment bangle hand stamped with the phrase 'Forget Me Not'. The perfect present for somebody special, who's out of sight but never out of mind. On trend and versatile, can be worn alone or combined with other bracelets to add the perfect finishing touch to any outfit. This brushed brass bangle is packaged in an organza bag, perfect for gifting. Please note as each letter is individually stamped by hand very slight irregularities may occur but these simply add to the handmade charm! This cuff style bracelet can be personalised on the reverse with up to three initials. Brass and gently curved by hand. Bracelet is 6mm wide. Diameter approximately 17cm. This product is dispatched to you by Elsie Belle Jewellery.